Today we went on an adventure. It was one of those days where I just decided no excuses we were just going to go and have some fun and see what we could find. Destination of choice, the Currumbin Rock Pools. We hadn’t been before and had little idea what to expect. 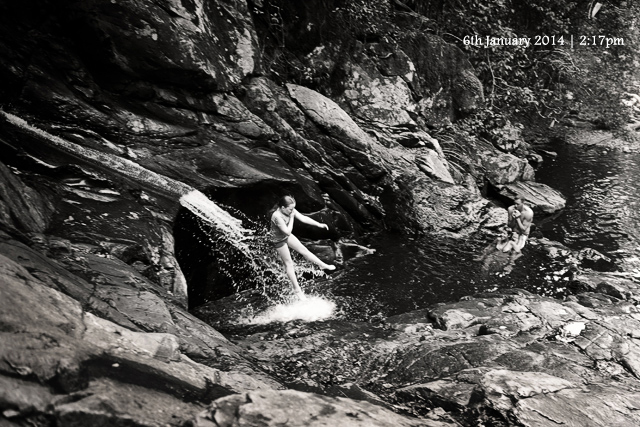 When we arrived at the first swimming hole, it started to rain – briefly. All good, girls had a swim. While we have swam at the beach before, this was their first experience in a fresh water waterhole, and they were very unsure. I grew up swimming in waterholes like this and just love going for a walk in the bush and then a swim. After a little while, we decided to head up to the second waterhole and enjoyed a lovely walk but hot walk. Here we found people enjoying a wonderful water-slide made by none other than mother nature herself. While I was a little concerned Elizabeth begged me for the chance to have a go and I had to admit it did look like good fun. After she had some fun we ventured back down to the first swimming hole where all 3 of us enjoyed cooling off while Grandma cooked us some lunch on the BBQ. Then we started to hear the thunder begin. Little did we know that there was a large storm front on its way. We just managed to eat our lunch before the lightening and thunder became to much for the kids and they started to get scared. It was a long and slow journey home, but I have to say, it was worth it. So grateful for fun little day adventures where we turn away from electronics and enjoy the beauty around us.